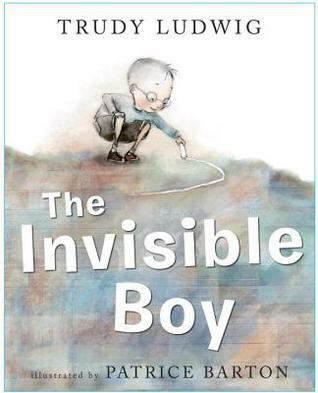 Scott Campbell shows us the openness and love of one little boy through text and pictures. The sweet little face of the boy no the cover is quiet and sincere with every single hug. And the faces of the people and animals he hugs are happy, surprised, touched, and even a little apprehensive about the unsolicited hugs. 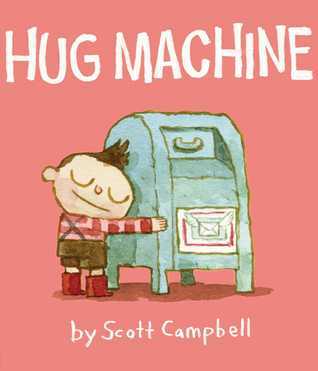 One of my favorite lines is, “Hug Accomplished!” Scott Campbell accomplished more than just creating a picture book. He also created an atmosphere of honest acceptance of everyone and everything in the boy’s world. What a great message to give our little readers. Charlie and Olivia were best friends. And the one thing they both loved was watching families on the beach. 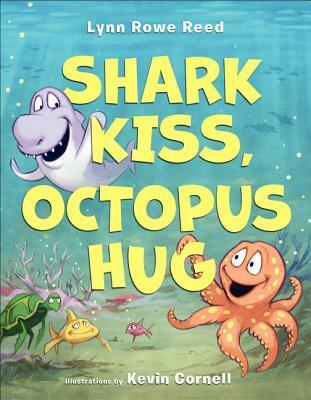 More than anything Charlie the Shark wanted a hug, and Olivia the Octopus wanted a kiss. They tried all the obvious ways to get hugs and kisses, including signs, shows, and rides. But there were no takers. Everyone ran away from Charlie and Olivia no matter what they offered in exchange for hugs and kisses. In a final attempt, they decide to offer free food, but no one wanted their algae soufflé. Charlie was heartbroken, so Olivia wrapped her eight arms around him and gave him a huge hug, and Charlie puckered up and gave her a huge kiss. Lynn Rowe Reed’s simple text is easy to read and fun for the kids. There are no real surprises, but lots of imaginative word play. Kevin Cornell’s illustrations really draw the reader into the story. His facial expressions are priceless. You’ve just got to love Charlie and Olivia and their need for hugs and kisses. I like this odd take on a beach story for preschoolers. The idea of kissing a shark or hugging an octopus is countered by the lovable characters. It’s nice to see them finally realize that they can give each other hugs and kisses. And it’s even nicer to see in the last illustration, that one little girl and her dog are willing to take the chance on two such odd friends. Marisol McDonald doesn’t match for several reasons. As you can tell from her name, one is Peruvian the other Scottish. Her skin is brown and her hair is orange. Her pants don’t match her shirt. Her favorite lunch is peanut butter and jelly burritos. Her drawings of pink polk-a-dotted elephants are unusual. Marisol McDonald wouldn’t have it any other way. She likes her unique combinations. But on the advice of a friend, Marisol McDonald tries to match. It was not a great success. She found matching clothes hard to find, matching sandwiches mushy, and matching pictures boring. Luckily for Marisol, her art teacher noticed her change and with a simple note signed ‘Ms. Jamiko Apple’ convinced Marisol that she was ‘simply marvelous’ just the way she was! The next day, Marisol put on her mismatched outfit and went to the pound to get a puppy. Of course, a regular dog just wouldn’t do and Marisol chose the one with one floppy ear and one pointed one, one brown eye and one blue eye. The perfect puppy for Marisol was mismatched and marvelous… she named him Kitty! 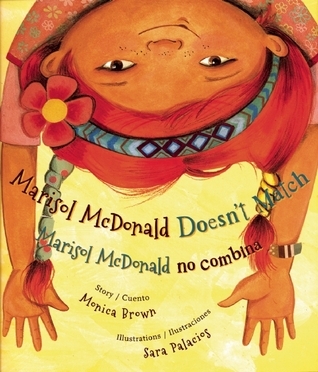 Monica Brown is a children’s author of multiracial heritage just like Marisol McDonald. She is Peruvian and Spanish mixed with Scottish, Italian, Jewish, Nicaraguan, Mexican, Chilean, and African… and everyone in her family share one thing – freckles. She is American, and she embraces all citizens of the world. She is the author of award winning bilingual books for children. Marisol McDonald Doesn’t Match is written in both English and Spanish text, one on either side of a page spread. Sara Palacios divides her life and time between Mexico City where she was born and San Francisco where she studies and works. Her illustrations are natural and authentic. Hidden in each one is text that appears to come from Spanish-speaking newsprint. The artwork is colorful and draws the reader into the story. This is the first book I have read by Monica Brown, but it certainly won’t be my last. I am completely won over by her style and universal themes. And, like Marisol McDonald, Monica Brown, and Sara Palacios, I too have a multicultural heritage which doesn’t match, but is nonetheless a perfect combination! I look forward to reading more of her work. See that sweet little green monster on the cover? 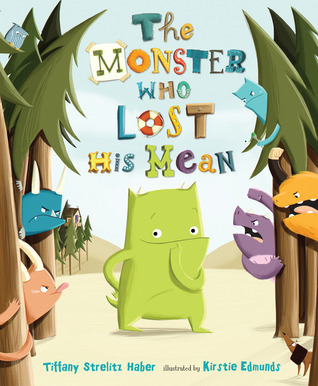 That’s Onster, the monster who lost his mean when the M in the word monster went missing. Without his M, Onster wasn’t mean anymore. The problem is that he is no longer accepted in his monster world. The other monsters tease him and refuse to associate with him. Onster tries looking for his M, but he can’t find it anywhere. Onster tries to pretend being mean, but he just can’t pull it off. Finally Onster accepts his newfound identity and finds acceptance with his new friends. Tiffany Strelitz Haber’s story is just right for little ones. It tells Onster’s tale in rhythm and rhyme without losing the essence of the story. And Kirstie Edmunds’ illustrations are so detailed that children (and adults) will be scouring each page with Onster searching for the missing M.
Tiffany Strelitz Haber second book, Ollie and Claire will be out soon, and I’ll be first in line to get a copy. 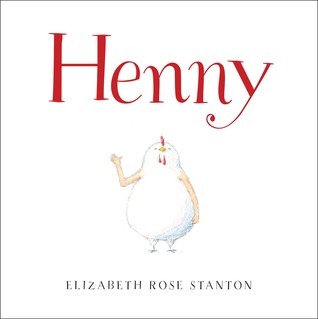 Henny is an adorable chicken who just happens to have been hatched with arms instead of wings. At first Henny is worried about having arms. She worried about being right- or left- handed, she worried about needing deodorant, getting tennis elbow, and even whether she should wear long or short sleeves. But that doesn’t stop this unusual bird from fitting in. Henny realizes that her arms are a special gift. She’s able to give Mr. Farmer a hand, twiddle her thumbs, carry a purse, hail a taxi, balance herself while ice-skating, or even fly (in a plane of course)! The text is rich and the illustrations are clean and simple. What a perfect combination! Pick up a copy today… you won’t regret it!